Ireland: All of Marks & Spencer's fresh meat and poultry, salmon, shell eggs and fresh milk comes from animals fed on a non-GM diet. The Kepak Group, which controls 60% of Irish beef exports, requires some farmers who produce meat for its flagship KK Club brand to exclude the use of GM animal feed. All Kepak's chicken meat comes from birds reared on a vegetarian, non-GMO diet. The Silver Pail Dairy in Co Cork has signed multi-million euro foreign direct investment deals with Baskin Robbins (the world's largest ice-cream retailer) and with Ben & Gerry's, to produce GM-free ice cream (made from milk from cows fed a certified non-GMO diet) for the European market. TLT International in Mullingar exports non GMO-fed live store cattle yearly, mostly to Northern Italy. All Irish organic meat and dairy producers avoid use of GM animal feed, including Glenisk which recently secured € 5m in foreign direct investment to expand its EU market share. UK: Tesco, Sainsburys, M&S and Budgen Stores all have quality labels for meat and dairy produce from livestock fed on certified GM-free animal feed. All of Marks & Spencer's fresh meat and poultry, salmon, shell eggs and fresh milk comes from animals fed on non-GM diet. Moreover, standard poultry sold in most UK supermarkets now carries a label certifying GM-free feed. Italy: The largest retailer, Coop Italia, already has a quality label for meat and dairy produce from livestock fed on certified GM-free animal feed. GM crops are banned in most Italian regions, including Tuscany where anyone found growing GM crops faces two years in prison or a € 50,000 fine. France: Carrefour, Cora, Auchan and Monoprix all have quality labels for meat and dairy produce from livestock fed on certified GM-free animal feed. 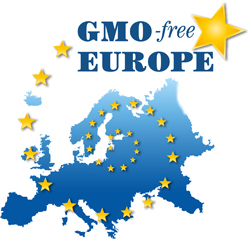 GM crops are banned by many regions and local authorities. Switzerland: The two largest retailers, Migros and Coop, systematically ban all GM food – including meat, poultry and dairy produce from livestock fed on GM feed – in their supermarket brands. Following a national referendum, the Swiss government implemented a five-year moratorium on GM crops and livestock in 2006.